The Lowly Blood Pressure Cuff: Is It Accurate? Bottom line: The good, old-fashioned automated blood pressure cuff is fine for patients with normal pressures or better. In fact, it tends to understimate the SBP the higher it is, which is fine. 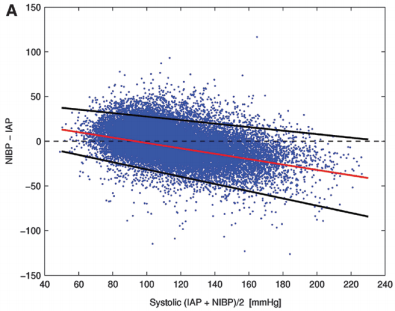 However, it overestimates the SBP in hypotensive patients. This can be dangerous! You may look at that SBP of 90 and say to yourself, “that’s not too bad.” But really it might be 80. Would that change your mind? Don’t get suckered into thinking that this mainstay of medical care is perfect! And consider peeking at the mean arterial pressure from time to time. That may give you a more accurate picture of where the patient really is from a pressure standpoint. Reference: Methods of blood pressure measurement in the ICU. Crit Care Med Journal, 41(1): 34-40, 2013. The transducer can “see” through the tubing and into the cuff. It is very sensitive to pressure and pressure changes. The computer directs the pump to inflate to about 20 torr above the point where pulsations in the air column cease. It then releases the pressure at about 4 torr per second, “feeling” for air column vibrations to start. When this occurs, the systolic pressure is recorded. Deflation continues until the vibrations stop, representing the diastolic pressure.